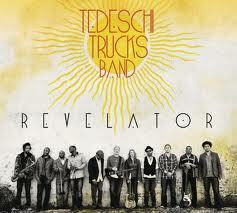 Friday night I had the pleasure of seeing "The Tedeschi Trucks Band" at The Riverside Theater in Milwaukee, WI. This super group consists of 11 of the finest musicians and artists including the husband and wife team of Derek Trucks (The Allman Brothers Band) and Susan Tedeschi. They’ve recently put aside their solo projects and have come together to form this amazing ensemble. What happens is pure magic!! The couple makes beautiful music together on the stage, that perhaps, only a couple can do. And the rest of the band wasn’t too shabby either. In addition to Tedeschi and Trucks, the band consists of Oteil Burbridge, Kofi Burbridge, Tyler Greenwell, J.J. Johnson, Mike Mattison, Mark Rivers, Kebbi Williams, Maurice Brown and Saunders Sermons who treated us to passionate bass, sax, trumpet and drum solos and 2 hours of music that covered blues, funk and soul. It’s exactly what a concert should be!! They played songs from their new album “Revelator” that included “Bound For Glory”, “Come See About me”, and my favorite, which combines Trucks' sweet slide guitar with Tedeschi's bluesy vocals perfectly... “Midnight in Harlem”. and really funked it up to end the night with Sly and the Family Stone's , "Sing a Simple Song" and "I Want to Take You Higher." There was boundless energy from the stage and from the crowd and nobody yelled at me for standing up and cutting a rug. That’s always a plus!